Founded in 1978, Quik Pawn Shop is one of the leading providers of Conventional Pawn, Cash Advance and Title Loans with 14 locations across Alabama. Known for their superior customer service and integrity, the name "Quik Pawn Shop" is a household word in the markets they serve. 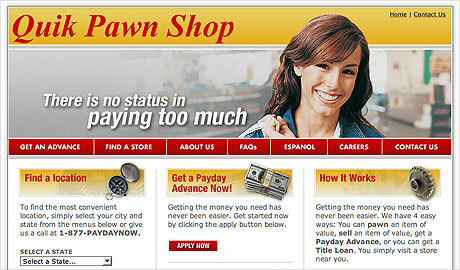 The Quik Pawn Shop wanted to establish an online presence that stood out among its competition. The site JVA developed has helped Quik Pawn Shop establish an unfair competitive advantage as most of its Clients browse their online inventory prior to visiting the store. Their online storefront has led to increased business and allowing them to raise the standard of service in their industry.